Asphalidesmus allynensis sp. n. and Asphalidesmus dorrigensis sp. 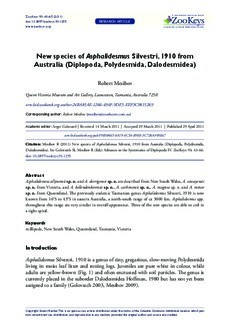 n. are described from New South Wales, Asphalidesmus otwayensis sp. n. from Victoria, and Asphalidesmus bellendenkerensis sp. n., Asphalidesmus carbinensis sp. n., Asphalidesmus magnus sp. n. and Asphalidesmus minor sp. n. from Queensland. The previously endemic Tasmanian genus Asphalidesmus Silvestri, 1910 is now known from 16°S to 43°S in eastern Australia, a north-south range of ca 3000 km. Asphalidesmus spp. throughout this range are very similar in overall appearance. Three of the new species are able to coil in a tight spiral.